I’m not sure I’ve ever come across a release that has had as much time, love and energy spent on it as this one by the French progressive act XII Alfonso. If there’s a prize for best CD packaging, then this is already a shoo-in. Nothing is going to beat the extensive colour booklet that pictures the musicians involved and the instruments they play, tells the album’s concept as a story you could read at bedtime and houses the three, yes three, discs of music. Simply, beautifully, stunning! 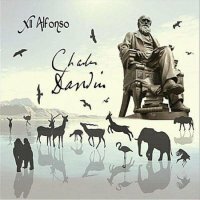 As you’ll have guessed from the album title, this set of three, hour long discs, retells the life and times of Charles Darwin through instrumental songs and vocal tracks. It incorporates English, French and Vietnamese lyrics and simply doesn’t skimp on any detail, both in storytelling, or musical finesse. Add to that a guest list that includes Francis Dunnery (It Bites), Mickey Simmonds and Robin Boult (Fish) and Maggie Bell (Jon Lord), among many, many others and this is a release to be taken seriously. The music, while always progressive in nature, covers as you’d expect from a release of this length, a huge amount of ground. Avant-garde, jazz, and straight rock all ooze into and out of view. However the two artists that are recalled most are Fish, through the theatrics and Manning, due to the storytelling through music. However through the sheer weight of volume, the quality doesn’t always sit right at the peak, although it is never poor. Instead the highlights segue in and out of a lot of mid-paced fare that doesn’t always hold the attention, especially when the lyrics are far, far too detailed and intricate for their own good. Some songs are set as conversations, describing the clash of science against religion that Darwin and his family encountered, others finds characters telling their stories in French and, as mentioned, Vietnamese. It is all vital to the story and well put together, but all too often the line between impressive and interesting is blurred, with the whole set impressing throughout, without always holding the attention. When you factor in that through its very nature (no pun intended), this is an album intended to be listened to from start to finish to fully appreciate, repeat listen actually become quite an ordeal.